Single Family Town home in MAINSAIL RESORT with 2 Community Pools, Tennis Courts, Gym, and Game Room. Less than 150 Yards to the Beach!!! 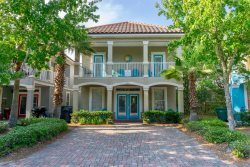 This Cozy Beachside Retreat is located within the gated community of Mainsail in Miramar Beach, FL. This desirable private community offers a peaceful and surreal sanctuary by the sea. It’s the perfect escape for the whole family. There are no roads to cross to the beach. This unit has covered carport parking. Enjoy the Spacious Open First Floor, perfect for entertaining, which includes the kitchen, dining, and living areas. The Living Area offers plenty of seating and comfort where you can kick back and watch tv, or simply enjoy spending time with your family while making memories. There is also a large sliding glass door that opens out to a lovely courtyard patio. A laundry/Bunk room with 2 Twin beds and Full Bath can also be found on this floor. King Master bedroom and master bath are located upstairs with private balcony with Gulf views. The Second Floor Queen Bedroom has a private balcony and bath. Third bedroom has a set of twin bunk beds. There are also 2 child size hallway bunks. Included are two pools (one heated) with co-located kiddie pools. Conveniently located with access to shopping,restaurants, and entertainment, all within walking distance. 1 Mile to Whales Tale, 3 Miles to Pompano Joe's, 3.2 Miles to Wahoos, 3.3 Miles to Captain Dave's. 1 Mile to Baytown Wharf, 2 Miles to Ocean Club, Across the street form Silver Sands Outlet Mall, 5 Miles to New Destin Commons Shopping Mall and Movie Theater. BOOK TODAY AND LET YOUR WORRIES SAIL AWAY!!! Refrigerator, Stove, Microwave, Dishwasher, Coffee Maker, Toaster, Garbage Disposal, Blender, Can Opener, Mixer, Pots, Dishes, Utensils, Eat-in & Counter, Kitchen Soaps Provided and Paper Products Provided (limited). Mainsail condominiums vacation condo rentals in Destin, Florida. Beachfront condo close to the beach, walking distance! Incredible beachfront family resort. Enjoy the beautiful view of the Gulf from an aerial point of view. Located right across from Silver Sands Outlet Mall. The resort includes all the amenities and recreational activities so you never have to leave the resort!